Feel free to visit my website www.aquaticdance.com for further information about the land and aquatic bodywork I offer, Dolphin Dance and the courses I organize. Lilia Cangemi is a Watsu Therapist and Instructor, Waterdance Practitioner, Healing Dance Therapist and Instructor, and the creator of Dolphin Dance, an original modality of her conception combining Deep Tissue, Shiatsu, Cranial Sacral and Reiki above and under water. She is also a Licensed Massage Therapist specialized in many energetic and soft tissue techniques, a journalist specialized in health issues, and a professional dancer/choreographer. She has accrued over 2500 hours as student, assistant, and instructor of Watsu, Healing Dance and Waterdance. After 6 years of Medical School in Italy, her country of origin, she has travelled and lived all over the world and explored many alternative healing arts. 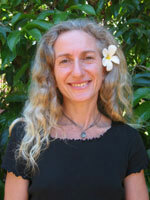 She is a Reiki Master and a professional of EFT and breathwork. Her experience includes many years of land and aquatic bodywork in private practice and over thirty years of teaching movement and modern dance. She brings to her classes warmth, humor and a special regard for each individual student, joined with an expert eye for technique and body mechanics. The dance becomes flow, the flow becomes healing. 3126 total hours ...Includes hours of 23 WABA water classes taught.